ENERGY STAR: A government-backed program helping businesses and individuals protect the environment through superior energy efficiency. Learn more at energystar.gov. ETL - Intertek: ETL (Electrical Testing Laboratories) was founded by Thomas Edison in 1896 and in their words, "Intertek provides quality and safety services to businesses across the globe. We help our customers improve their products, assets and processes to make them more successful in their chosen markets". Learn more at intertek.com/. Fluorescent (CFL): Compact Fluorescent Lighting - Energy efficient lighting option that uses a chemical reaction of gases inside a tube to generate light. Fluorescent lighting is more efficient that standard incandescent lighting but new technology in LED lighting is slowly phasing out Fluorescent lighting. Fusible Link: Term used with fire rated dampers. The fusible link is two pieces of metal joined together that will release when the temperature reaches a set point (212° on Air King models), breaking the link and allowing the curtain to seal off the ducting. GFCI Circuit: Ground Fault Circuit Interrupter. Switch utilized for high voltage electrical shock protection. The GFCI will shut off an electric power circuit when it detects that current is flowing in a way it is not meant to, such as through water or a person. Grease Filter: Filter used to catch grease and other contaminates from entering the unit. Most commonly used with range hoods. Grease filters should be cleaned at least once per month or more depending on usage. Hanging Brackets: Used to mount certain Air King exhaust fans. They attach from one ceiling joist to another ceiling joist and allow the installer to position the exhaust fan between them. Can also be referred to a Hanger Bars or Hanging Rails. Horizontal Exhaust: Exhaust that enters into the duct work on the horizontal plane (out the side or the back of a unit). HVI: The Home Ventilating Institute - HVI - is a non-profit association of the manufacturers of home ventilating products. 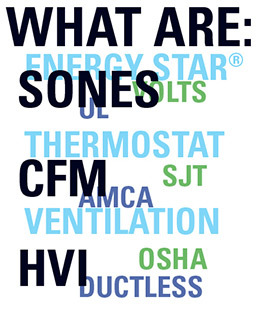 HVI offers a variety of services including, but not limited to - test standards, certification programs for airflow, sound, energy performance for heat recovery ventilators, market support and three annual meetings to discuss common industry issues. Through a Certified Ratings Program, HVI provides a voluntary means for the residential ventilation manufacturers to report comparable and creditable product performance information based upon uniformly applied testing standards and procedures performed by independent laboratories. Together these activities help to promote the health and growth of the home ventilation while providing consumers with valuable information and confidence in their choices. Learn more at hvi.org. Incandescent: Common household lighting option. Many incandescent lighting option have been phased out over the past several years in favor of more efficient lighting option such as CFL and LED. Infinite Speed Control: Controls the speed of the motor. The user has the ability to set the unit at any desired speed level. Keyhole Slots: Mounting system for installing units where the mounting screws or nails can be put into place and then the unit is lifted over the screws and slid into place. NFPA: The mission of the international nonprofit NFPA is to reduce the worldwide burden of fire and other hazards on the quality of life by providing and advocating scientifically-based consensus codes and standards, research, training, and education. Established in 1896, NFPA serves as the world's leading advocate of fire prevention and is an authoritative source on public safety. In fact, NFPA's 300 codes and standards influence every building, process, service, design, and installation in the United States, as well as many of those used in other countries. NFPA's focus on true consensus has helped the association's code-development process earn accreditation from the American National Standards Institute (ANSI). Learn more at nfpa.org. Night-Light: Low wattage light feature. Air King products that have this feature utilize either a 4 Watt or 7 Watt bulb.